I’d like to share with you 5 useful tips when it comes to home staging your kitchen. DECLUTTER – This not only includes what you can visually see on your benchtops but also what you cannot see. All pot drawers, cabinets, pantry items, corner cabinets, cutlery drawers – you get the picture! Take everything out of your cabinets and drawers and clean your carcasses really well. If you have edging on your carcasses that has peeled or worn off. Replace it with new edging. This will freshen up your internal cabinets and give your kitchen a nice neat tidy appearance. Remember potential buyers will go through your cabinets! CABINET DOORS & DRAWERS – are they clean and not chipped or broken? If they are in need of repair either try and replace the doors depending on the age of your kitchen or alternatively you can paint your doors and drawer fronts. If you are not confident to do this yourself outsource to a painter who specialises in kitchens. If you want to keep the costs down use acrylic paint or for higher end kitchens consider a 2 pac finish. 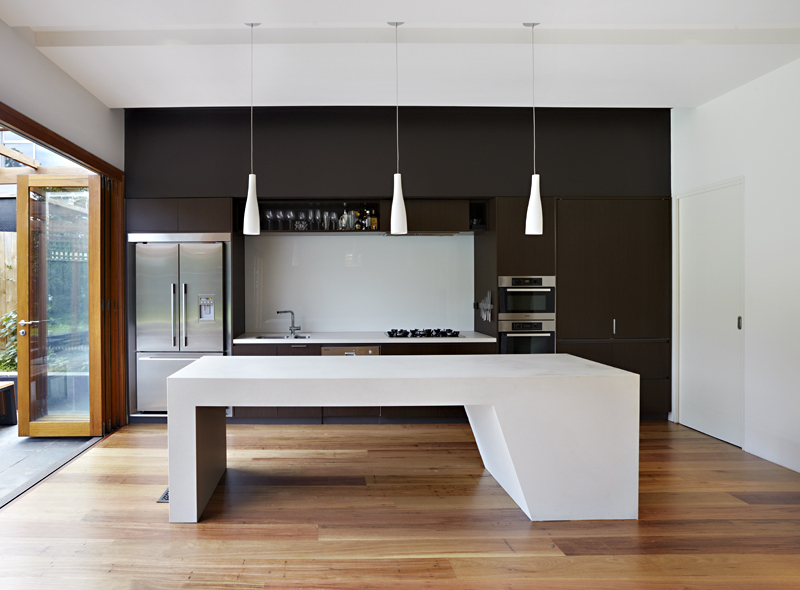 BENCHTOPS – Are your benchtops in need of repair or perhaps they need an upgrade? Consider using a company such as Granite transformations who use quartz, granite and and recycled glass in a polymer base that produces a diamond gloss finish which is scratch, stain and heat resistent. Whats even better still is the slabs are only 6.5mm thick so they can go over your existing benchtop. If you would prefer a new benchtop then consider using some of the fantastic looking marble and stone look alike benchtops from Laminex. Otherwise if marble or reconstituted stone are more your thing and your budget allows there are some amazing colours from Caesarstone that will totally transform the look of your kitchen and give it the wow factor. LIGHTING – This can have such an enourmous impact on how your kitchen is presented. I would suggest if you have an Isand bench to consider using either 2-3 pendants (depending on the size) hanging down over the Island to give the bench great task lighting. Use cool white globes for a brighter looking benchtop or warm white for a more ambient soft yellow colour. When hanging your pendants they will usually sit about 750mm above the height of your benchtop. For general lighting in the kitchen there are many options. Consider using led downlights with a wide beam angle of around 155 degrees. An led oyster also gives out great illuminance without casting shadows in your general workspace. STYLING – Adding some finishes touches to your kitchen without going overboard can really make your kitchen look amazing. Try adding a really lovely marble and timber chopping board with a few decorator items placed on it like a pot of fresh green herbs. You could add some height by using a tall vase and filling it with lovely green ginger leaves. I would suggest you keep your styling simple and elegant.